Please read these safety guidelines for activities carefully with your children, and then post them in an accessible spot at your campsite. 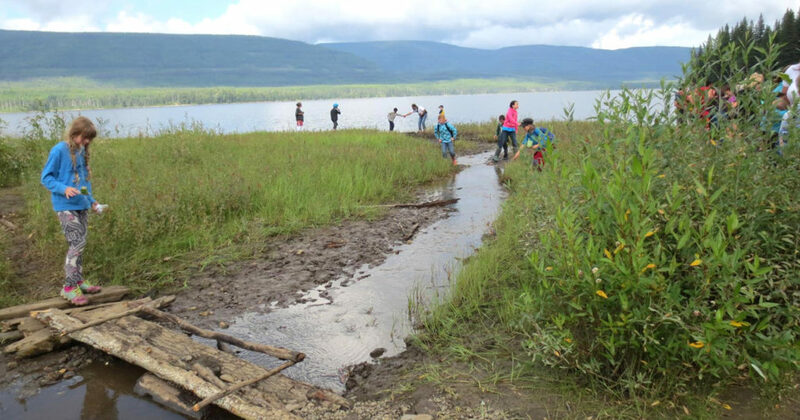 New provincial legislation was recently introduced (Bill 10) that prohibits smoking on all properties owned by School District 59, including the Gwillim Lake Outdoor Education Facility, home of the BCFFC Gwillim Lake camp. No smoking is allowed anywhere within the facility, including personal motor and recreation vehicles on the property. It is important to note that where individuals are caught smoking on District property, it may now be dealt with as a criminal offence, as well as a breech of the school district policy. Provincial penalties under the Offence Act range up to fines of $2000 or 6 months imprisonment. BCFFC could also loose the privilege of access to this facility in future years and this would mean the end of French Camp at Gwillim Lake. Swimming in Gwillim Lake is prohibited. This cold mountain lake has a lot of floating debris, sometimes visible and sometimes just below the surface. Conditions change quickly, depending on spring run-off, weather, etc. Children do not necessarily realize that they cannot swim as well in a cold lake as they can in a warm one, or a swimming pool. Drop-offs are extreme as close as one foot from the shoreline. In places, the lake bottom drops as much as 30 feet in one step. Our Moniteurs may or may not have lifeguard training, but a deep dark lake is not the same as scanning a swimming pool, or a shallow, clear lake, where the bottom is visible. To swim during program, we would require a 1:1 child:Moniteur ratio. This is not possible, so we strictly prohibit swimming during program hours. You can tube and wade in the creek if you need to cool down. If you choose to swim after program hours: Children must be accompanied by an adult, and again we recommend the 1:1 child:adult ratio. If you do not have your own life jacket, please borrow one for little ones, whether wading or swimming. We try to use ropes and buoys to show which area we believe to be the safest. 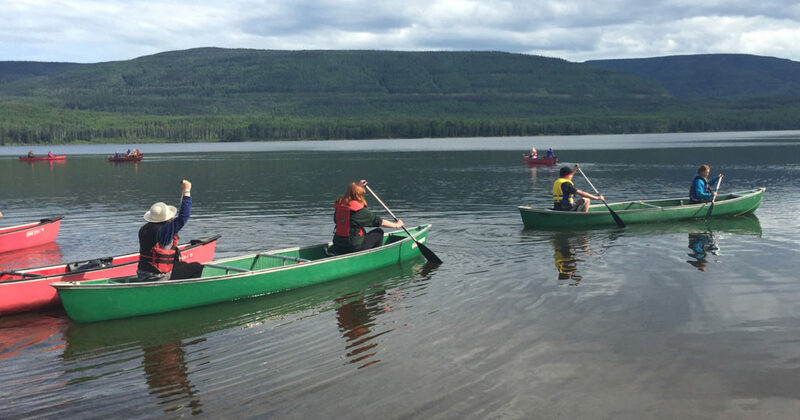 During program hours: Children are in the canoes with adults, throwbags, the required safety equipment, and properly fitted paddles and life jackets. They canoe along the shoreline, in a group. The Canoe Specialist teaches and monitors all skills, with help from parent volunteers who have taken the Canoe Specialist’s workshop and are aware of what she will be teaching the children. The specialist has an emergency air horn, and there is an emergency boat on shore. Out of program, feel free to use the canoes at your own risk. We recommend that no fewer than two boats go out together. Children must always be accompanied by an adult. This lake can change rapidly, so make sure you can get back to shoreline in 5 minutes if need be. Always let someone know that you are going out, and when you plan to return. Put you your name on the canoe sign out sheet on the message board as well. Make sure that life jackets and paddles fit properly, and that safety equipment is in the canoe. A volunteer will be responsible for signing out the canoes and equipment. We will notify you of the time and place he/she will be available daily. Please sign out equipment at the designated time, with the volunteer. Return everything to its appropriate spot when you are done. Helmet law is in effect here. You will automatically lose your bike for the day if you are caught riding without a helmet. Park the bikes in the bike racks. It is unsafe to have bikes lying all over the site. No biking in the mini-forest, as we’ve had injuries. No biking beyond the Main Cabin (including the beach): please park and walk. Ride slowly if in pedestrian areas-pedestrians rule! Any bike trips off site should include the following safety measures. Make some noise along the way, to alert wildlife that you are there. A Few Rules Regarding Recycling and Other Garbage etc. We do collect refundable recyclables. If someone wants to organize additional recycling, please contact the local committee early in the week. The containers for refundable recyclable cans and bottles are in the log shelter. The garbage trailer is on the road-the lid must be kept closed at all times. We don’t want bears in it. Campers are responsible for getting their garbage to the trailer by 10:00 each night. A volunteer will also ensure that the garbage cans at the main firepit are emptied at 10:00 p.m. Please do not use these containers after 10:00 p.m. Recycling will also be locked up at 10 p.m. to deter wildlife. Tenters and cabin dwellers’ food must be stored in vehicles or inside the cabins, during the night. Again, we don’t want any nocturnal visitors. Make sure your grey water containers are dumped or inside for the night as well. A final note about the site: Gwillim Lake is unspoiled because of diligent users. We seldom see a gum wrapper or any other garbage on the ground. That’s pretty incredible, considering we are about 120 users here at one time, for a week. BCFFC has always striven to leave this paradise as intact when we leave as when we arrived. Thank you for disposing of garbage properly, not picking flowers and leaves, and being kind to the wildlife, big and small (you’re allowed to swat mosquitos! ).